The chattering classes are fascinated by the Republicans’ internecine battle to redefine the party in the wake of the George W. Bush calamity and the Mitt Romney defeat — from Senator Rand Paul’s revolt against the neoconservative foreign policy, to intellectuals flirting with “libertarian populism.” Less attention has been paid, however, to the stirrings of what Senator Paul Wellstone dubbed “the Democratic wing of the Democratic Party” — now beginning to challenge the Wall Street wing of the party. Perhaps the strongest demonstration of this has been the barrage of “friendly fire” that greeted the White House’s trial balloon on nominating Lawrence Summers to head the Federal Reserve Bank. More than one-third of Democrats in the Senate signed a letter supporting Janet Yellen, now vice chairwoman of the Fed. More than half of the elected Democratic women in the House of Representatives signed a similar letter. Many were appalled at the notion of passing over the superbly qualified Yellen for Summers, with his notorious record of denigrating and dismissing women. Few Americans know who the Fed Chair is, much less what kind of power he or she wields. But the mention of Summers roused fierce opposition in Congress and in the blogosphere because he has championed the policies and politics that must be transformed if the Democratic Party is to be an advocate for working Americans once more. As Katrina vanden Heuvel, editor of the Nation wrote in the Washington Post, Summers drew opposition because he is the “poster boy for the Wall Street wing of the party — literally. ” (Summers joined then-Treasury Secretary Robert Rubin and then-Federal Reserve Chairman Alan Greenspan on the now risible 1999 Time magazine cover celebrating the “Committee to Save the World” — before the global financial collapse exposed the folly of their policies). 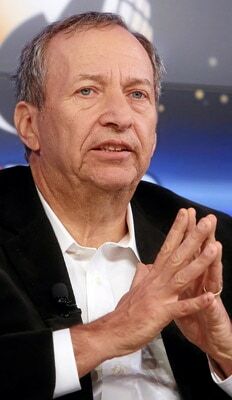 Under President Bill Clinton, Summers was Rubin’s powerful protégé and championed the deregulation of Wall Street. Summers scorned the chairwoman of the Commodity Futures Trading Commission, Brooksley Born, when she sought to even to begin a discussion about regulating the market in derivatives. (Instruments that Warren Buffett later called “weapons of financial mass destruction.”) He defended the Clinton administration’s trade policies — the North America Free Trade Agreement, the World Trade Organization, opening to China — that led directly to unprecedented and unsustainable trade deficits, as multinationals rushed to ship good jobs abroad. He even came to defense of Enron, telling the California governor that rising energy prices were the result not of market manipulation but of poor regulation. After a troubled stint as president of Harvard, Summers made millions consulting for hedge funds on Wall Street. He then went back through the revolving door — into the Obama administration, where he supported the bailout of the banks without restructuring them, suffered (though opposing internally) the premature turn to austerity and pressed on with the old trade policies. The opposition to Summers reflects the growing revolt against these policies. In the House, the Congressional Progressive Caucus recently used its annual budget to indict the misguided focus on budget deficits and austerity, and lay out an alternative course of public investment and progressive taxation that would generate more jobs, spur balanced growth and still put our books in order over the next decade. Senators Sherrod Brown (D-Ohio), Jeff Merkley (D-Ore.), Carl Levin (D-Mich.) and newly elected Elizabeth Warren (D-Mass.) have spearheaded the charge against Wall Street. Brown has called for breaking up banks that are too big to fail and, according to Attorney General Eric Holder, too big to jail. Warren and Levin have used hearings to expose and indict the regulatory lassitude that has resulted in continuing bank scandals, as the big banks continue to treat regulatory fines as a minor cost of doing business. Brown, Senator Bernie Sanders (D-Vt.) and many others are leading the opposition to the administration’s corporate trade policies. This winter, the president’s push to gain “fast track” trade authority — to be able to force an up or down vote on future trade accords now under negotiation — will face fierce opposition from those calling for a new manufacturing and trade strategy to revive manufacturing here at home. Over two-thirds] of the House Democratic freshmen legislators have already expressed their opposition. Next year congressional Democrats will push to mitigate our Gilded Age inequality. The administration will join the drive to raise the minimum wage. Progressives will demand action on perverse CEO compensation schemes that give executives multimillion-dollar personal incentives to focus on next quarter returns rather than long-term strength. A sign of progressive influence is President Barack Obama’s turn against austerity in the run-up to the ugly budget debate due to begin this fall. He has stumped for a long-term strategy to rebuild the middle class – founded in part on vital investments in education, infrastructure, new energy and research and development. But Democrats are openly worried that he will cede too much to the Republican right to gain agreement on keeping the government operating. The president met with Democrats on the Hill Wednesday to reassure them that he would not accept cuts in Social Security, Medicare and Medicaid benefits in any negotiation. He vowed to push to repeal the sequester cuts and defend programs for the poor. The backdrop to all this is an economy that is no longer working for working people. As the economy struggles to come out of the Great Recession, inequality is getting worse. The middle class continues to decline. The poor are growing more isolated, with less opportunity to escape. The jobs being created off less pay, benefits and security than those that were lost. Wall Street has been saved — while homeowners were left to struggle on their own. The president has sensibly indicted the right’s trickle-down policies, arguing that we must build the middle out. But he’s assuming that we can do that while bolstering the big banks, sustaining the corporate trade policies and doing little to empower workers and curb executive excesses. His administration’s economic team has been staffed largely by an old-boys network, revolving in and out of Wall Street. The opposition to Summers has exposed the growing backlash within the Democratic Party to this old way of doing business. Whether it can overcome the big money politics that gives Wall Street a hold on the party remains to be seen. But the bankruptcy of the old policies — in theory and practice — is clear. As the stunning objections to the Summers nomination show, the demand for change is building.